"...Alfred Corgan was in Donald Burgett's squad and was wounded by the same shell that killed the four troopers, other troopers were wounded as well..."
We have recently received an additional collection of materials from Mr. Rick Mommers of the Netherlands. 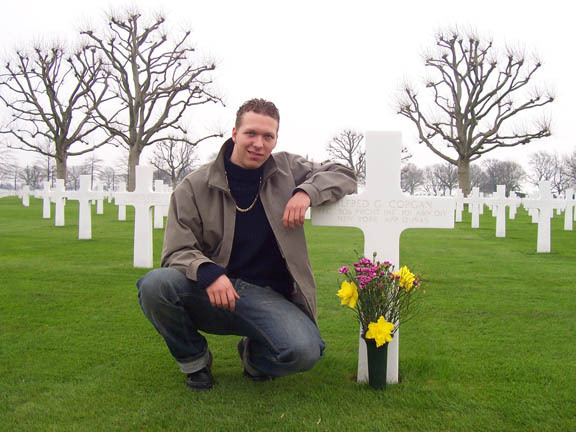 Rick has recently adopted a fourth grave site at the Margraten American Cemetery in the Netherlands. Rick's newest grave site is the grave site of Alfred G. Corgan who served with Co. A., 506th PIR, 101st Airborne. 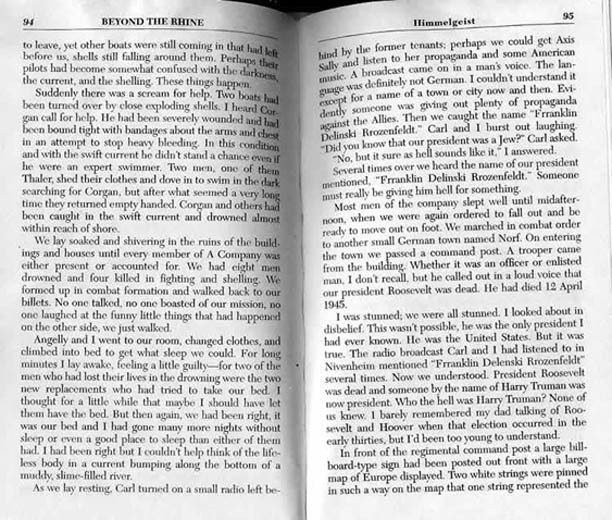 Alfred B. Corgan's death on April 12, 1945, Himmelgeist Germany (operation Varsity) as told by Donald R. Burgett, Sgt., A Co., 506th PAR. This story was told me by Donald R. Burgett, Sgt. A Co. 506. He is still alive (and was in a documentary about D-day) and fought in all the airborne campagnes in WWII. He knew PFC Corgan also a little. This was what he told me about him. I will also enclose you a page of his book where Corgan was named in and where his KIA accident was described in. Four of their men were killed by an exploding artillery shell when we first arrived in Himmelgeist. They held that town as ordered until the Germans shifted their reserve armor, then retired to the Allied side of the Rhine as planned. Alfred Corgan was in Donald Burgett's squad and was wounded by the same shell that killed the four troopers, other troopers were wounded as well. 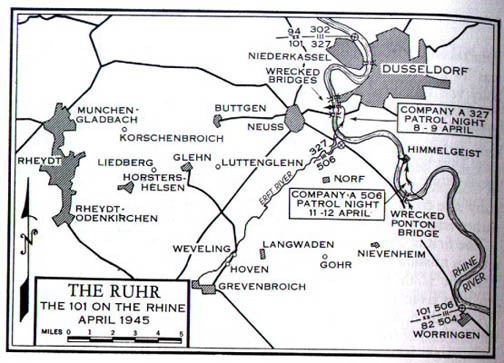 On returning they received artillery and tank fire in the dark all the way back across the Rhine. Corgan had his arms bandaged and bound close to his sides to try and stop his heavy bleeding. A shell landed close to his boat, it capsized and Corgan, along with several other troopers, some wounded, were drowned. Their bodies were recovered about three days later on the river shore about two miles downstream. I am Alfred Corgan's sister-in-law. Muriel Dorothy (Cross) Corgan was my oldest sister. I cannot tell you how pleased and overwhelmed I was when I received your message. The pictures you sent and the data sheet on his young life now fill in the many blank spaces in my mind regarding Al. Muriel, to the best of my knowledge, had no pictures of herself with Al. She carried a newspaper picture and clipping regarding his death in her wallet. Several years after his death, she came to visit me in Brockton, Massachusetts. While shopping in a local department store, someone stole her purse which contained the wallet. The purse and wallet were never found. I don't recall ever seeing a duplicate of the picture and newspaper clipping nor any other photos. This bothered me over the years because I really knew so little about Al. What I do know about both Muriel and Al, I would like to share with you. Muriel was born April 14, 1925 in Albany, New York, the oldest of three children born to William Henry Cross and Viola Koons Arkills. I, Mildred Jean (Cross) Howland was born on June 2, 1927 in Poughkeepsie, New York. William Henry Cross, Jr., our younger brother, was born October 7, 1929 in Poughkeepsie, New York. We were raised in Poughkeepsie and neighboring towns. My sister, Muriel and our brother, William, are deceased. I do not know when or how Al and Muriel met. They were 19 when they got married. The family and I never got to know Al and knew so very little about him. I am certain they knew each other for a very short period of time, a matter of a few months, before they married. My family lived in Poughkeepsie at that time. I was about 16 and still in high school. I remember meeting him for the first time right after they were married. They went to the State of Maryland to get married. New York State, their home of record, required prospective brides and grooms to have blood tests before getting married. The process took time, something they did not want to wait for. Maryland did not require blood tests so one could get married quickly there. Many servicemen desiring to marry quickly before going overseas went to Maryland to get married. It has always been my belief and understanding that they went to Elkton, Maryland to get married. My genealogy file lists the place of her marriage as Upton, MD. I noted on the data sheet you sent that they listed Als' state of residence as New York. This is correct; however, they listed his county of residence as that of Delaware. I never knew that there was a county called Delaware in New York State. I am going to do a little research to check it out. We have a state called Delaware and it's not far from Maryland. Al was due to go overseas and wanted to get married before he left for overseas duty. I am not sure where he was stationed when they got married. After they married, Muriel continued to live at home in Poughkeepsie, NY. Al was first reported as missing in action. Then, she was notified that he was killed in action in Germany. As I said, my family knew very little about Al and met him only a few times. We did like him very much. What we knew about him came from my sister, Muriel. He was a farm type young man and very much in love with his wife. Al came from Unadilla, New York, the only son of Anson Corgan. His mother, her first name unknown to me, died in 1938, one month after a miscariage. He was raised by his father. I believe his father was a farmer. After Als' death, his father came to visit Muriel and our family in Poughkeepsie. It was the first time that Muriel and the family met Al's father. He was a very lost and lonely man who was trying to handle the grief and loss of his only child. We felt he was turning to Muriel as a new found daughter. As I said, my family and I never got to know Al because Al and Muriel weren't married very long. He came home on several weekend passes from the Army and stayed at our home. He was shipped overseas to Germany shortly after their marriage and was killed about 9 or 10 months later. I don't know the details surrounding Al's death. Information came from Muriel, but I don't know who provided her with the information surrounding his death. She said he was killed in the Rhine River after the Germans opened fire on the Red Cross boat he was in. I don't know the source of the information or if it is even the truth. I have a very sharp memory so can recall many events in the past. Al and Muriel did not know one another very long and had never met prior to his entering the service. Unadilla and Poughkeepsie are too far apart for them to have met, known each other and had a relationship before he went into the Army. How/where they met has always been a mystery to the family. I believe Al was stationed in Ft Campbell, Kentucky when they met. He may have been on leave in our city and met her. I think they married in the Summer of 1944, having known each other but a few months. He was shipped overseas in August 1944, several months after their marriage. Our family didn't have the opportunity to know him. After our initial meeting, he spent several weekend leaves at our home before being shipped overseas. From what we observed, he was a quiet young man and very much in love with his wife. Movies were about the only entertainment they had...TV wasn't in existence at that time. I don't believe he was the type that visited bars for entertainment...very quiet. He had no car. He rode the bus or train from Ft Campbell, KY to Poughkeepsie, NY. I don't know if they corresponded. I doubt there was time for that because of his immediate overseas departure. Being in a combat zone in Germany didn't leave him much time to write. Muriel met Al's father for the first time after Al's death. He came to visit her at our home and spent several days with her. He, too, was a quiet man amd so very lonely. He missed his only child, his son, and I think he was looking to Muriel to fill the void in his life...perhaps looking towards her as a daughter to replace his son. According to Muriel, his father raised him alone after his mother's death. I think it is true that Mr.Corgan's wife was deceased as he came alone to visit us. That was the first and only time he visited Muriel. He returned home - Muriel said he was a farmer. My heartfelt thanks to you for looking after Al's grave. He was laid to rest there in 1945 and I knew that your countrymen had adopted the graves at the Netherlands American Cemetery. I never knew who took care of Al's grave all these years. At 18 years of age, you have to be commended for your loving care for others. For the record; Although my given name is Mildred, I use that name only for legal matters. I go by the name of Dale...you may call me Dale. Private Alfred G. Corgan of Unadilla enetered the service of the US army on Feb. 11, 1944. From Camp Upton, Long Islands, he was sent to Camp Blanding, Florida, where he was stationed 17 weeks and where he won medals for rifle sharpshooting, marksmanship with machine guns, and expert pistol shooting. 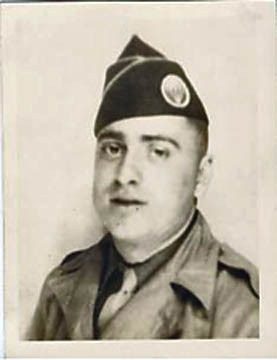 Then asking for a transfer to the paratroops, he passed his examination and he is now stationed at Fort Benning, Georgia. He has completed four weeks of jump training during which he has made five jumps from a plane in flight. The last was a jump at night involving a combat problem on landing. His father, Anson B. Corgan, lives on Unadilla R. D. 1. the family are former residents of Loomis. I also have the death anouncement enclosed. Alfred's father was ANSON CORGAN, his mother was EUNICE M. DEWEY, their marriage day was 6 JANUARY 1922 . Anson died when he was 58 (not 100% sure), he was born 1 FEBRUARY 1896. Alfred married MURIEL DOROTHY CROSS born 14 APRIL 1925 and died 31 MEI 1989. She is burried on UNION CEMETERY in HYDE PARK, NY (westchester county). Alfred's uncle (brother of his father) was HENRY CORGAN born 7 DECEMBER 1923 married MURIEL C. HOWES. Alfred's Grandpa (dad of his father) was AARON CORGAN married with EMMA FULLER. Darwin W. born Sept. 1885 was 14 years "
Royal I. born May 1890 was 10 j years "
Henry S. born April 1892 was 8 years "
William A. born March 1896 was 4 years "
Olive May born April 1899 was 1 years "
William Cross born 9 Sept. 1893 in Highland, NY en died 9 Feb. 1950 in Croton on Hudson, NY. (his first wife was Lucy Buss, married about 1919 and born in Belgium). His second wife was Viola Koons Arkillis, married about 1924. she was born 27 Jan. 1903 in Grahamsville,NY ad died 13 Nov. 1985 in Poughkeepsie, NY. William was in the army in WWI and fought in France and Belgium. I enclosed you two newspaper clippings, one is the one I described you above and one is the death anouncement in a newspaper in 1946. Also enclosed are two pictures of the cemetery in his early days when the crosses where made of wood. The other picture is Alfred in his combat jacket. When there are some more things you have to know please feel free to ask. When I should find out some new things I will let you know too. The following ran in the Oneonta, NY, Daily Star on 7 April 2005. A teenager in the Netherlands who adopted the grave of a Walton teen killed during World War II is searching for information about the soldier. Rick Mommers, 18, sent an e-mail to various people and organizations, including The Daily Star and the Delaware County Historical Association, seeking information about Pfc. Alfred G. Corgan. Corgan died almost 60 years ago, April 12, 1945, less than a month before the war ended in Europe on May 8, 1945. Corgan entered the service Feb. 11, 1944, and left for overseas duty in August 1944. He was a paratrooper. 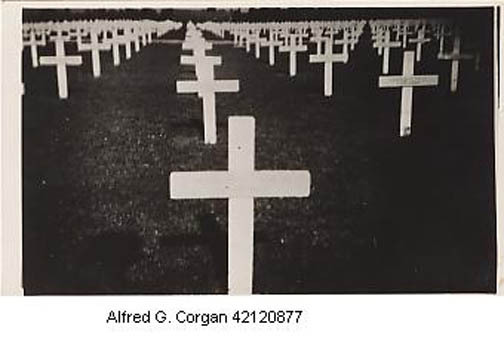 Mommers wrote, "At the American Military Cemetery in the town called Margraten, I adopted the grave of Alfred Corgan. He lived in Walton, Delaware County. He was fighting for our freedom during the Second World War." 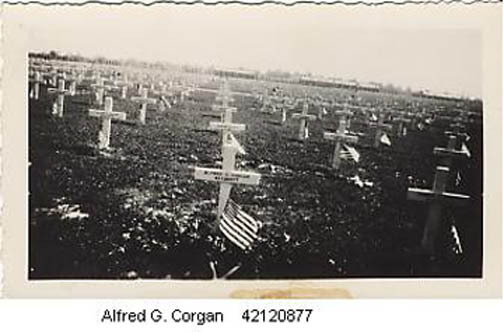 Mommers adopted Corgan's grave after a school trip to the military cemetery in Margraten, where he heard that it was possible to adopt the graves. "After the guide showed and told us some things about the cemetery, we asked him (about) the necessary person to contact to adopt a grave. He gave us the address," Mommers wrote. "When we came home, we directly took our ballpoints and started to write. A few days later we received our (assigned) grave." Mommers initially adopted three graves. Around Christmas 2004, he requested a fourth grave and was assigned that of Corgan, which launched his search for information. "In case you knew or know family of Alfred Corgan, I hereby want to ask you if you maybe can help me to gather more information about the soldier whose grave I adopted," Mommers wrote. Mommers said he wants to know what Corgan looked like, where he lived, if he had family living in this area and how he spent his youth. "It would be nice to know more about the person whose grave I take care of and lay flowers," Mommers wrote. Tim Duerden, Delaware County Historical Association director, said he found a photo of Corgan in the Aug. 16, 1946, issue of the Walton Reporter. The caption under the photo said Corgan was the son of Mr. and Mrs. Anson Corgan of Unadilla, formerly of Loomis, and he married Muriel Cross of Poughkeepsie shortly before going overseas. Duerden said he thought what Mommers was doing was wonderful and hoped someone would be able to help him find out more about Corgan. Elsa Corgan Houck, the Trout Creek postmaster, said she is one of Corgan's few surviving relatives but doesn't remember Alfred, who was her first cousin. Corgan was 19 and living in Walton when he enlisted in 1944. He was working as an automobile serviceman, according to military records. Houck, 58, of Trout Creek said her father, Henry Corgan, and Anson Corgan were brothers. She is the youngest of seven children, so her cousin Alfred was much older and died before she was born. "My father died in a car accident when I was 3 years old," Houck said Tuesday. "There are only a few nieces and nephews left." Mommers said he was able to locate Corgan's sister-in-law, Jean Cross Howland. She wrote Mommers a letter and said Corgan's wife, Muriel, is dead. "I do not know when or how Al and Muriel met," Howland wrote. "The family and I never got to know Al and knew so very little about him. My family lived in Poughkeepsie at that time. I was about 16 and still in high school. I remember meeting him for the first time right after they were married. "They went to the state of Maryland to get married. Maryland did not require blood tests, so one could get married quickly there. Many servicemen desiring to marry quickly before going overseas went to Maryland to get married. "After they married, Muriel continued to live at home in Poughkeepsie," Howland continued. "Al was first reported as missing in action. Then, (Muriel) was notified that he was killed in action in Germany. That date will always remain in my mind because it was also the same day that President Franklin D. Roosevelt died. "Years later, (Muriel) married Nicholas DeCandio from Poughkeepsie. They settled in Cicero, Ill. After they divorced, Muriel resumed her name of Muriel Corgan. She returned to Poughkeepsie and died there on May 31, 1989. She had no children. "(Corgan) was a farm-type young man and very much in love with his wife. "His mother, her first name unknown to me, died giving birth to Alfred. He was raised by his father. After Al's death, his father came to visit Muriel and our family in Poughkeepsie. He was a very lost and lonely man who was trying to handle the grief and loss of his only child. "Muriel said (Alfred) was killed in the Rhine River after the Germans opened fire on the Red Cross boat he was in. I don't know the source of the information or if it is even the truth," Howland concluded. Mommers had information about Corgan from the soldier's military records that indicated he was a member of the 506th Parachute Infantry Regt, 101st Airborne Division, Company A. He died in Himmelgeist, Germany, during Operation Varsity. He was awarded the Purple Heart. Mommers said he also found an excerpt from the book "Beyond the Rhine: A Screaming Eagle in Germany" by Donald R. Burgett, in which Burgett described Corgan's death. Corgan was injured during a battle and drowned after the boat he was being transported in overturned when shells exploded nearby. "I adopted the grave of Alfred G. Corgan to pay honor to (at least one of) the million young soldiers that fought thousands of kilometers from their homes and where a lot of them lost their lives for our freedom," Mommers wrote. "The one little thing I can do back for Pfc. Alfred G. Corgan to pay my honor and respect to him is by putting some flowers on his grave at days he would be happy and home together with his loved family and friends to celebrate days like Easter and Christmas," he added. "I will continue this till my end of days." Mommers said he is not a history buff. "History in general I don't enjoy so much, but World War II is my passion," Mommers said. "Most I like the individual stories of the soldiers. Each individual carries his own story, which must be preserved for later generations so that they know what their ancestors have been through." According to www.holland.com, units of the 30th Infantry Division of the First American Army liberated the area around the American Military Cemetery on Sept. 13, 1944. One of the first cemeteries for victims of the battles on German soil was established in Margraten. The victims were buried in Holland, as it is a rule that American military cemeteries are never in hostile territory. The first burial took place there Nov. 10, 1944. 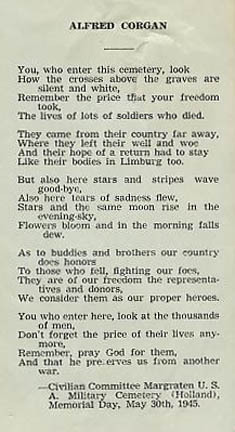 Most of the 8,301 soldiers buried in Margraten lost their lives during the airborne and ground operations to liberate the eastern part of Holland, during the advance through Germany across the Ruhr and Rhine rivers and during the air battles over those areas.